The KEYRite is a joint venture project between Janet Dougherty (CEO of NUAZ Limited) and Mike Pollett (CEO of Pollett Furniture). 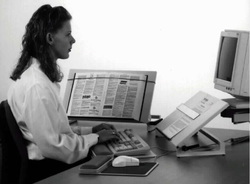 Janet conceptualised the KEYRite when working as a Consultant in Occupational Health, educating employers and employees in reducing RSI (repetivie strain injury/occupational overuse syndrome) at the pc workstation. Mike ran with the project and did the design work and is the manufacturer. Both Janet and Mike market and sell the KEYRite. Comes in Bookledge or Full Ledge. Why do you Need a KEYRite? The KEYRite Full Ledge model has a ledge set right across the KEYRite platform base. The Full Ledge is most suitable for displaying data files. 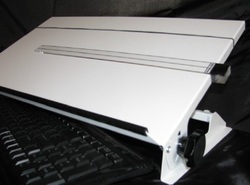 The KEYRite Book Ledge with a 55mm upturn is the third model in the KEYRite range and is excellent for users with very thick manuals and/or large loose leaf files.